I’m going completely off of my normal blog topics of cooking, baking, gardening, sewing, and home life today. I heard on the news that June is Brain Health Month. I didn’t know that was a thing, but since I’ve been learning sooooo much about brain health in the past 8 weeks I decided to share a bit of my learning about Cerbellar Stroke and Vertebral Artery Dissection. After I had my stroke I tried to find as much information as I could on the topic. There isn’t much out there because a Cerebellar Stroke with Vertbral Artery Dissection makes up only 1% of all strokes. I told you I get weird stuff!!! One of the neurologists I saw suggested a book, which I laughed at because reading is incredibly hard for my brain right now. Luckily, the font was really big and if I read it slowly it almost made sense. Actually, it made a lot of sense which is why it’s worth sharing. 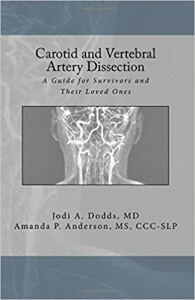 The book is called Carotid and Vertebral Artery Dissection; A Guide for Survivors and Their Loved Ones. *Exhaustion, background noise sensitivity, and sensitivity to light and sound are very common. *Difficulty word-finding when speaking is totally a thing. *I say that my stroke was a “small” stroke because I don’t look like a stroke victim. There is no such thing as a small stroke. My stroke was just in a different part of my brain, which controls different parts of my body. *Vision impairment is common. My vision gets blurry if I read, write, or watch tv. *Constant head pain is common. My head pain is in a new spot for me. It seems to be in the same spot as my stroke and it’s just always there. *Memory difficulties – I though my memory was bad before my stroke. Wow! Now it’s horrible. It’s not just something funny anymore, it’s super frustrating. According to the book, this is SUPER common. *”If you survive a dissection, you’ve been given another chance at life.” Talk about a slap in the face and making you wake up and pay attention! In one of the stories, they suggest really looking at your life and finding your purpose. 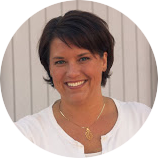 I’ve always known my purpose in relation to home, family, and early childhood education. What if I don’t ever have the stamina to teach little people again? *My ER doctors were amazing and it’s practically a miracle that they discovered that I had a stroke. *I have a constant feeling that I’ve stepped off of a boat. *Most patients report head and neck pain. *Pain and dizziness may accompany every activity. *Chronic pain leads to frustration. Umm, yes it does. This is an understatement. *Emptying the dishwasher is my nightmare. It will cause me to need to rest for about an hour before recovering and this is something other people experience as well. *Half of patients with this type of injury and stroke will have no idea what caused it. I know that my stroke was triggered by rolling my head-neck around in the shower, but I don’t know what caused the initial artery injury. *”Being at the mercy of someone else’s convenience” while recovering takes so much patience that it’s almost painful. It’s hard to let everyone do everything while you just sit and watch. *Being healed does not mean being the same as you were before. *”There are no research studies that have analyzed survivors of carotid and vertebral dissections with chronic pain.” So, I have no idea where to start with managing my pain. My last intense headache landed me in the walk-in clinic getting shots. I can’t take Advil, Aleve, or migraine meds. Tylenol does nothing for me, so I’m left with no options for pain relief except ice packs and meditation. *Patients look normal on the outside, so it’s hard to believe they are feeling so much pain, confusion, and dizziness. On one hand, this is really great because my kindergarten students have no idea how horrible I’m feeling. On the other hand, most of the time I look ok and I just have to fake-it and show that I’m doing great. *Things to try at home: keeping lights low, using earplugs (this was great at my son’s basketball tournament), peppermint extract for soothing, ginger as a replacement for Sumatriptan (migraine med), and basil and clove oil to relax muscles. *Anxiety after these issues is common. I think I had a panic attack, a few weeks ago, around the time I think I had another small stroke. *Adequate sleep is important. I sleep about 2 hours longer than the rest of my family and I also nap every day. Yes, every day. *Vertigo can be present for YEARS after this type of stroke… noooooooooo! I can’t take it! Saying that it’s vertigo makes it sound like you have just a little bit of dizziness. Some days I have to take anti-nausea meds just to function. I have what I would call vertigo almost all of the time, but much of the time it’s like vertigo on steroids. *I need to find my new normal. This makes me want to cry because I really liked my old normal. This is going to take some serious adjustment. *If I experience new or worsening symptoms in the future, I need to call 911 or go the ER. I also need to balance this with the fact that life can’t be lived in the ER. Luckily for me, my first stroke presented itself in a way that I KNEW I needed to call 911 and get help right away. *I have no idea when I will feel/be better. Every brain is different. Every situation is different. There is no way of knowing when I will be normal and what my new normal will be. So, let me just this again. If you have experienced a Carotid or Vertebral Artery Dissection, and especially if you’ve had a Cerebellar Stroke resulting from the dissection, I strongly recommend buying this book. It is worth the $20 to gain some great information but also to know that there are other people out there dealing with this same issue.